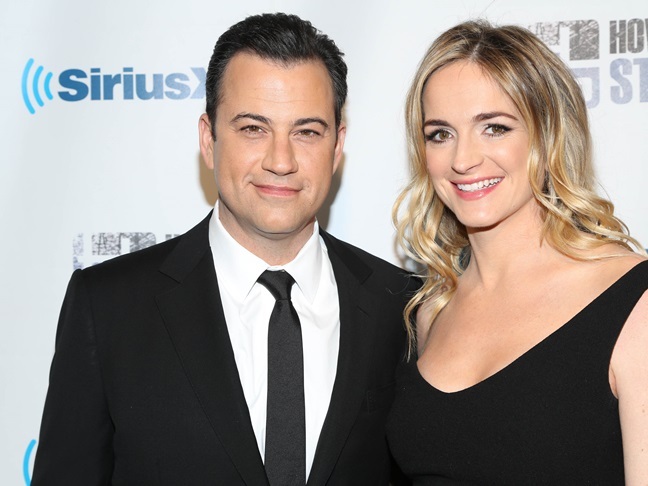 Late night talk show host Jimmy Kimmel and his wife, writer Molly McNearney, are expecting a baby together! Jimmy announced their baby news during an appearance on Ellen yesterday. When Ellen asked about baby names, Jimmy said he was hoping for a boy named "Karate", so he could use the double K's like the Kardashians do. Jimmy thinks Karate Kimmel would be a great name, but not as great as Karate Effin Kimmel. The comedian joked that whatever he names the baby, he hopes Molly will let him use "effin" as the middle name – for dramatic impact. I'm pretty sure he wasn't serious. We hope. Jimmy and Molly have been dating since 2009 and tied the knot in July of 2013. This will be the first child for Molly and the third for Jimmy. He shares two adult kids, Katie, 22, and Kevin, 20, with ex-wife Gina Kimmel.